An interesting question came up in the PowerCLI Community. Can one extract the datastore statistics, that are used for the space utilization graphs in the vSphere Client, with PowerCLI ? The graph in question, which you find in the Datastores Inventory view under the Performance tab, looks something like this. A quick browse through the available metrics, on the SDK Reference PerformanceManager page, showed that these metrics are indeed available. With the disk.capacity.latest, disk.provisioned.latest and disk.used.latest metrics this should be a simple script. But was it ? As it turned out there are a few gotchas! The SDK Reference, on the Storage Capacity page, mentions that these metrics are available for virtual machines and for datastores. In this case we obviously want the metrics for the datastore. Which brings us immediately to the first problem, the current Get-Stat cmdlet doesn’t accept datastore entities. No problem, I have an older post, called Get-Stat2 : another way of getting at the statistical data, which I should be able to adapt to retrieve datastore statistics. The script uses a number of methods on the PerformanceManager object, to retrieve the counterId and available instances for the metrics. Once it has these it calls the QueryPerf method to get the actual statistical data. On each call I seemed to get an error, stating “optional value not set”. A quick search through the VMTN posts showed that I was not the first one seeing that error when using datastore metrics. Unfortunately none of these posts provided me with a workable solution. After some trial and error, I discovered that the problem was caused by the intervalId property. Although the SDK Reference states that you can either use begintime/endtime or intervalId, it seems that for datastores the PerformanceManager methods only want you to use beginTime and endTime. This required some fundamental changes to the Get-Stat2 script, but in the end I got it working. As with most metrics, you have the option to use the instance property, to identify which specific statistical data you want to retrieve. According to the SDK Reference page, the Storage Capacity metrics support the following instances. The VMid is the value property of the MoRef of a specific virtual machine. .DESCRIPTION The function is an alternative to the Get-Stat cmdlet. Specify for which interval you want to retrieve statistics. PS> Get-Stat2 -Entity $vm.Extensiondata -Stat "cpu.usage.average" -Interval "RT"
Throw "-Entity parameters should be of type HostSystem, VirtualMachine, ClusterComputeResource, Datastore or ResourcePool"
Throw "Only 1 interval allowed." Throw "-Interval parameter $Interval is invalid for datastore metrics." Throw "-Start parameter should be a DateTime value"
Throw "-Start time should be 'older' than -Finish time." Throw "-Stat parameter $st is invalid." Throw "-Instance parameter invalid for requested stat: $st.`nValid values are: $validInstances"
Line 79: Datastore statistics are only available from Historical Interval 2 (HI2) onwards. Line 82-103: Datastore metrics don’t seem to like the intervalId property. To avoid this problem, the script transforms the interval to a Start and Finish time, provided there were no explicit Start or Finish parameters passed. Line 94: For the Start time, the script substracts 1 interval duration from the length of the historical interval. Let’s start by investigating which metrics are available for a datastore. The result of this call is a list with the available metrics. Next let’s see what instances are available. As we already learned from the table above, this metric only has a “” instance. But the disk.used.latest metric has 3 different types of instances. Note that the VMid numbers that you see in this list do not necessarily mean that these virtual machines currently have files on the specific datastore. Remember that we are looking at historical data! The only way to know what is currently on the datastore, is to get the metrics and check if there are actual values returned for a specific VMid. If the value is -1, there were no files from that virtual machine on the datastore at that specific time. Retrieving the actual statistical data is easy now. As we expected, this gives us the statistical data for a specific virtual machine on the datastore. The original question, how to reproduce the specific graph that is available in the vSphere Client, becomes quite straightforward. 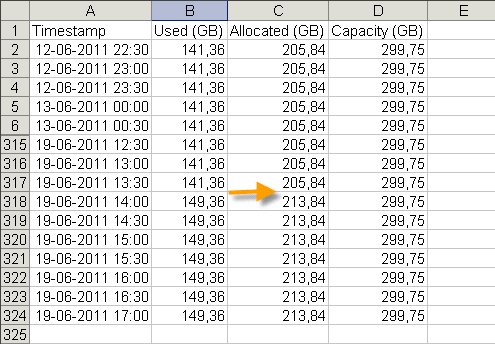 This produces a nice CSV file with the values from the graph. Notice how you can clearly see the addition of an 8 GB virtual disk, which we also saw in the screenshot at the top of this post. Exception calling “QueryAvailablePerfMetric” with “4” argument(s): “A specified parameter was not correct. I’ll check if I can reproduce the error. 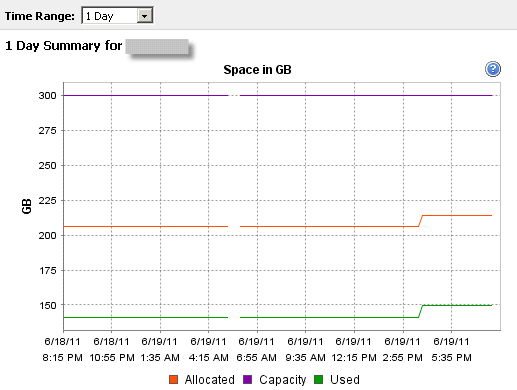 We often found free space in a datastore has dramatically reduced. Is there any way we can get the VM name and the amount it contributes to this free space utilization? I added “StoragePod” to the list of acceptable entities to be able to get Datastore Cluster stats (just used and provisioned), and it worked just fine! Hi Luc, you´re right, some datastores don´t have HI4 statistics. When I change to HI3 or HI2, all works fine. But, after a few runs of the script, I see that some VMs don´t show on the list. And after a time looking, I found that the VMs with disks bigger than 2Tb was the trouble. 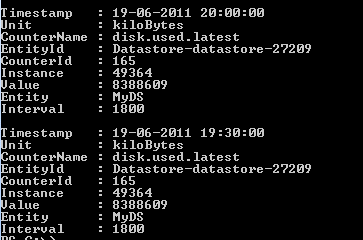 I think the problem is to handle the numbers, because a VM got a disk of 3Tb and the “disk.used.latest” is under 2Tb. 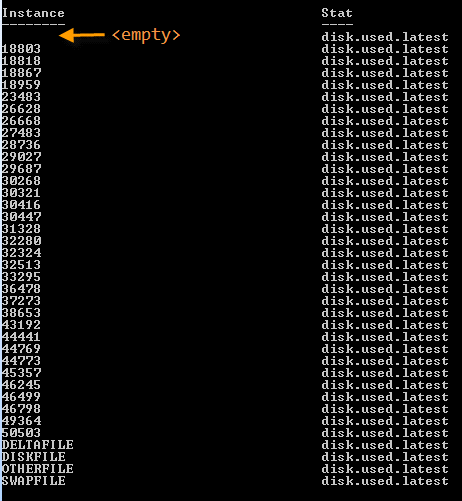 If i cut the “disk.provisioned.latest” line on the original script, the VM is showed on the list. I hope you can understand my idea because my english is too poor. @tequesta,in the code you specify Historical Interval 4 (HI4). That means data from more than 1 month ago with an interval of 1 day. If the Get-Stat cmdlet doesn’t find any data that corresponds, it will not return anything at all. Like I said in the other reply, are you sure that there is data for HI4 available for these specific datastores ? You can check by looking under the Performance tab in the vSphere client. You could also try to get the report for a more recent intervals (HI3, HI2….). Let me know if that brings something ? Thats the problem, I have less than 1 month of data of some datastores. When I use this add to get the information of all datastores, some datastores are not reported, i got a message error saying something about null pointer, but if i run “get-datastore”, the list is complete. @tequesta, it could be that there are no statistics collected for some datastores. A quick check would be to look in the vSphere client under the Performance tab and verify if there is data for these datastores that seem to fail. Can you check ? Export-Csv : No se puede enlazar el argumento al parámetro ‘InputObject’ porque es nulo. If i try the command Get-Datastore, the list is complete. Worked the first time I tried it, and your step by step examples helped immensely. Thank you Matt, glad it was useful for you. I have tested the first script and works like a charm fro one single datastore, but the loop version which seems to be very improved is having my entire vCenter service down every time I run it, do you have any suggestions? Do I need to create a separate .ps1 script that contains the code you mentioned in your reply to Michael that calls the original Get-Stat2 script? Sorry, I’m a little bit at a lost as to the general process and have been struggling to get this working. I have been trying to figure out how to get a CSV with those 4 pieces of information. Thanks. Hi Michael, in the last example the datastorename is in the $ds variable. You could loop over all your datastores and then add the datastorename in the output. Let me know if that produces what you are looking for ? Yes, a report of all datastores in vCenter for the three metrics mentioned, “disk.capacity.latest”,”disk.provisioned.latest”, “disk.used.latest” is a good enough start for me. I assume it’s simply adding more metrics into variable definition for $metrics. If not, please include some “how-to” comments on adding more so we fine tune it for future use. We also have mutiple vCenter servers in different sites so if the script can include functionality to account for mutiple vCenter servers, it would be awesome. I’m on the same boat as Shannon. I’m a little bit at a lost on what do with these sniplets. Can you provide some more generic, step by step, instructions on how to run this successfully for PS dummies like myself. Or if there is a single .ps1 file that I can use, that would be awesome. @Greg & @Shannon, I’ll be more than glad to help, but first tell me what you want to achieve with the script ? A report on all the datastores in your vCenter ? And what metrics do you want in the report ? There are many datastore metrics available. This looks brilliant and exactly what I want, however I am not a scripting person and am struggling to make these snippets work as one complete script applied to our vcentre instance. Has someone converted this to a single script that will run against a designated vcentre server? i was looking for the max queuedepth counter. but no luck. Afaik there is no metric for queuedepth in the PerformanceManager. But esxtop has a counter called AQLEN that gives the queuedepth per physical adapter. In my Hitchhiker’s Guide to Get-EsxTop – Part 2 – The wrapper post you see this counter in row 24 of the included spreadsheet. With the Get-EsxTopValues function from that same post you should be able to retrieve that counter. Another solid post! The scripts does not leverage cmdlets much, therefore can be easily ported to Java using vSphere Java API. Please let me know if anyone wants to give a try and we would like to include the samples. Thanks Steve. Indeed there isn’t a lot of PowerCLI in there, mostly APIs. This get-stat2 script will come in very handy. Thanks!